The blog’s time machine, which can travel only in the past and the 90s decade in particular, goes back 20 years (my God how the years gone by…), to the 7th of June, 1995 and the Orlando Arena, where the Orlando Magic hosted the Houston Rockets for the first game of the 1995 NBA Finals. 1995 was a crazy season for the young Orlando team that had never been to the Finals before; the team had entered the league in 1989, but with excellent draft choices Shaquille O’Neal (1992) and Anfernee Hardaway (1993) it turned into a contender by winning 57 games (1st in the East) that year. The most amazing thing that Orlando team was able to pull off, was to eliminate MJ45’s (the mortal one) Chicago Bulls in the ECSF. However, they needed 7 games to beat the very good Indiana Pacers in the ECF. Houston on the other hand was the defending champion (it had defeated the Knicks 4-3 in 1994 NBA Finals) and it was coming to the 1995 after an even crazier season: a) traded 2/5 of last year’s starting five to acquire Olajuwon’s Phi-Slamma-Jamma brother Clyde Drexler form Portland, b) finished 6th in the West with 47-35 record, c) beating everybody in the West without a home-court advantage (2-3 against Utah – 60-22 record; 3-4 against Phoenix – they were down 3-1; and 2-4 against the MVP’s, David Robinson, Spurs), to reach the NBA Finals. On the 7th of June 1995, then, the Rockets were going to begin another series without home-court advantage against the enthusiastic and extremely talented, but inexperienced Magic team. There was great anticipation for the game, as Olajuwon was going to face O’Neal, who was the last of the great centers of the 90s that he hadn’t played against, to that point; he had defeated Ewing’s Knicks last year in the Finals and Robinson’s Spurs just a few days ago in the WCF. It was only, the young O’Neal that was standing in his way to the ultimate recognition of his superiority among ‘the beasts’ of the 90s; Charles Barkley and Karl Malone had been taken care off as well – Sir Charles in probably the worst way (Barkley’s Suns were up 2-0 in 1994 after winning the first two games in Houston, to finally lose 4-3; while they were up 3-1 in 1995, to end up losing 4-3 again). There was also the Anfernee Hardaway-Clyde Drexler battle that was attracting a lot of interest as well; two tall 6’7 all-around guards going against each other. The young and athletic Orlando started the game strong and at the end of the 1st quarter Magic were up 30-19. Orlando’s GM at that time, Pat Williams (the man that basically created that team by picking Shaq and Penny) said recently that: ‘I remember vividly standing in my little corner and we were taking it to Houston and it felt like we were picking up where we had left off in Game 7 against Indiana.’ ‘I remember sitting there thinking, “Oh boy, (then-NBA Commissioner) David Stern is not going to be happy if this series turns into a rout. He won’t be happy and it won’t be good for the league,”’ Williams added. But he didn’t know what was coming to his young Orlando. Houston started picking up and at the end of the third quarter was up by 7 points; 87-80. In the fourth quarter Orlando reacted and regained the lead, but then the unthinkable happened; Nick Anderson (Magic’s first ever draft that had 22p. 11r. and 5a. in that game) went to the line and missed four consecutive free throws, to give the opportunity to the Rockets’ starting point-guard and current NBA TV’s commentator Kenny Smith to score one of his seven made three-pointers that night, to tie the game 110-110 with 1.6 seconds remaining. 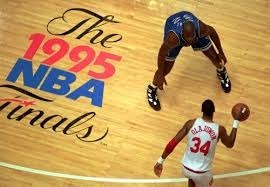 The game went to overtime were Hakeem ‘The Dream’ (31p. 6r. 7a. 4b. )gave Orlando a nightmare for many years to come, as he won the game with a tip-in, 0.3 seconds before the end of the overtime; final score 120-118 for the Rockets. Even now Orlando fans find it difficult to ‘digest’ the closing sequence of Gm1. ‘For years I had nightmares, honestly, about Game 1,’ Nick Anderson told recently Fox Sports Florida. `I’ve had other coaches and people around the league tell me that if we had won that first game that they think we would have won the series,’ Brian Hill said, Orlando’s head coach at the time. `I still believe that to this minute. If we had won Game 1 our team would have had a whole different mindset. It seems like Game 1 took so much out of our guys. Losing that game because we were playing so well for such a long period of time, and then it was so hard to get them back after that,’ he added.